It’s a basic tenet of biology that organisms adapt to survive. Over millions of years of evolution, the species that exist on our planet today are the ones that have successfully adapted to shifting climates and conditions. And what’s true for biology is also true of business: the ability to change is essential for long-term success. The banking industry right now is facing many changes. Innovation is rocketing ahead, competition is increasing, customer demands are shifting, regulatory pressures are mounting. Against all of that, banks must be able to remain profitable. It is unsurprising that with so many headwinds blowing, some institutions have found themselves taking a hard look at their operations and making difficult decisions about whether and how to stay in business. The trend lines over the last 30 years or so have shown a steady decline in the number of bank charters in the United States, due to both failures and merger and acquisition activity. In fact, in 1984, there were close to 18,000 banks—today, just under 6,000 remain. That amounts, roughly, to a loss of one bank per business day. Consolidation may be ongoing, but that’s not to suggest that the industry itself is shrinking—in fact, it’s just the opposite. 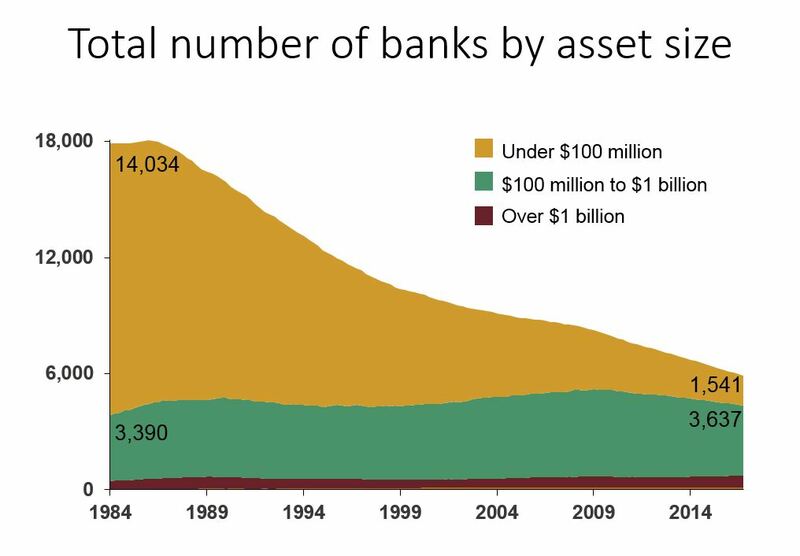 Total assets held by commercial banks have continued to grow over the last several years, now totaling nearly $17 trillion, and the total number of bank employees has held relatively steady at around 2 million. What has changed, however, is the composition of the remaining banks. As consolidations have taken place (particularly in the post-Dodd-Frank Act era), the number of banks with more than $1 billion in assets has grown between 9 and 12 percent over the past six years, while those under $1 billion have undergone consolidation at significantly higher rates. For example, 18 percent of banks between $100 million and $1 billion disappeared between 2010 and 2016. In addition, 44 percent of banks under $100 million disappeared. American consumers agree that having a diverse banking system is important—in fact, a recent ABA/Morning Consult survey found that an overwhelming 89 percent believe that it is somewhat or very important that the U.S. have banks of all sizes. Regulators and lawmakers, too, have noted the significance of a diverse financial system. But words alone are not enough to ensure the survival of the nation’s community banking industry. And community bankers know that maintaining an independent operation doesn’t happen automatically—it takes strategic vision, goal-setting and indeed, an ability to adapt to change. That’s why many are making adjustments to their ownership or operational structures that have allowed them to maintain their identities as community banks, create shareholder value and continue meeting the needs of their local customers and communities. It was a few days before Christmas of 2012 when Brian VanFosson learned that his bank was on the verge of being sold. Citizens Bank of Rogersville—located about 10 miles south of Springfield, Mo.—had been owned and operated by two local families since its founding in 1908. But as the bank’s then-president and CEO Nancy Ruyle and her husband, Charlie, neared retirement, they—like so many others at family owned and operated institutions across the country—found themselves with no one to take over the bank’s day-to-day operations. Knowing the owners were looking to sell quickly, VanFosson—a former bank examiner who had been working as a loan officer at Citizens for 14 years—sprang into action over the holidays. He quietly began reaching out to potential investors to ask if they would consider joining him in an effort to buy the bank. In the end, an initial group of 42 individuals came together to form a new holding company, Wildcat Bancshares. VanFosson notes with pride that nearly all the investors were local members of the Rogersville community, and many were longtime customers of the bank. And that sense of local ownership was the key selling point. VanFosson created a three-phase process for the selling of bank stock that gives the holding company the first right of refusal to purchase. If the holding company chooses not to buy back the stock, existing individual shareholders have the option to buy before it is offered up to outside investors. When he finally approached Nancy Ruyle about purchasing the bank, she was skeptical. “She tried to talk me out of it,” he recalls. But VanFosson believed in the viability of the bank and in the support he had from the local group of investors backing him, and pushed forward with the transaction. Under VanFosson’s leadership, the bank has seen returns on assets of between 1 and 1.3 percent, which he credits to careful monitoring of operational expenses, growth in the bank’s loan portfolio (which has exceeded 70 percent since the new ownership group took over), and the income generated from the bank’s $47 million mortgage servicing operation. While the circumstances around the sale of two community banks are never identical, VanFosson believes that his holding company model can be easily replicated in other communities if bankers are willing to invest the time and lay the groundwork. “You have to have the right people in place, the consultants and the attorneys.” But at the heart of it, he adds, it’s all about having strong relationships with members of the community—and that’s something community bankers already do exceptionally well. With a population of 1.3 million, the state of Maine has just over 30 banks and nearly 60 credit unions, which can make organic growth opportunities few and far between. And for the 20-or-so Maine mutuals that rely on retained earnings as a source of capital, rising costs and limited growth opportunities isn’t exactly a recipe for long-term success. “If you talk to the directors of any of those mutuals, they’re going to agree on two things. One is that there will be fewer banks in the future, and the second is, ‘my bank will be a survivor,’” observes Charles Petersen, president and CEO of Biddeford Savings Bank, a 150-year-old mutual that serves what was historically one of the state’s many textile towns. Seeking a way to reduce some of Biddeford’s operating expenses, such as information technology costs (Biddeford at the time was relying on a third-party vendor for most IT needs), Petersen found himself speaking to Rick Vail, president and CEO of Mechanics Savings Bank, another mutual institution headquartered about an hour north in Auburn. As it happened, Mechanics Savings Bank had invested in building a strong IT team that was looking to branch out and partner with other mutual banks to provide technology services. What began as a conversation about sharing tech soon turned into an opportunity to share much more, as Vail and Petersen saw other ways that the two banks could benefit one another. After several meetings between the CEOs, management teams and boards, the decision was made to join together and create a shared holding company, Maine Community Bancorp, which allowed both institutions to streamline their back office operations while continuing to serve their customers under their respective names. 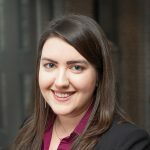 Without laying off a single staff member at either bank, Vail and Petersen have shifted 67 employees to work for the new holding company and successfully re-negotiated certain third-party contracts and consolidated vendors. The result was a 10 percent decrease in net operating expense, which they expect to stabilize at 12 or 13 percent over the next few years. In addition, the two banks are now participating $20 million in loans to one another, which has allowed them to better support the credit needs of new and existing customers. From a financial perspective, both CEOs say their partnership—the “alliance,” as they call it—has been very successful. As the combination was finalized, the two banks targeted combined savings over $2.1 million over the first three years. As of today, Vail says they’re on track to more than double that figure.